Built - Summer - 1977 - While visiting Chanute AFB in Illinois in 1976, I had seen several VW-based kit cars at an authorized dealer for Antiques & Classics, Inc. out of Buffalo, New York. In the summer of 1977, I was an enlisted man in the U.S. Air Force and stationed at Grand Forks Air Force Base, North Dakota. 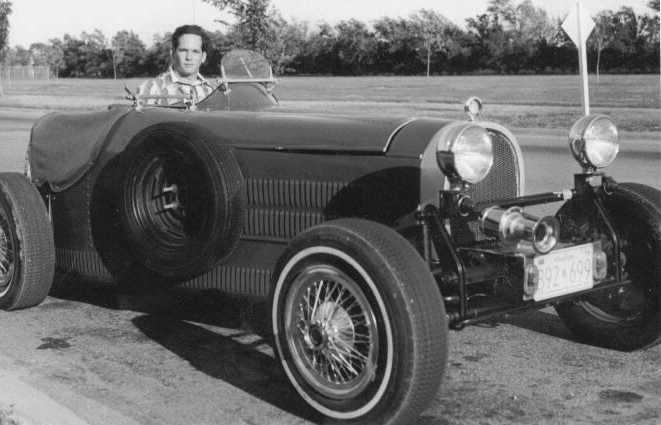 At that particular time in my life, I had the time and money to build a modest kit car; so I ordered A&C's least expensive kit. This kit car was based on a VW pan and drive train. I guess you could say that it was a 'single donor' kit car. This 1927 Bugatti replica cost me less than $2,000 to complete. The car survives to this day, and is located in Strasburg, VA. This picture was taken by a newspaper photographer for the Grand Forks AFB newspaper. The leather hood straps and cycle-type fenders were yet to be installed. The only problem I had in making the car legal involved the lack of windshield wipers. To pass inspection, I had to remove the windscreens. It seems cars do not have to have windshields, but if they have one, then they must also have a wiper! After the first time, however, the car passed inspection with the windscreens on; and in fact, had the inspection sticker affixed to one of them. © Wade's Cobra Site. All Rights Reserved. This site is in no way affiliated with Ford, Shelby, Bugatti, or any other companies on this site that own a trademark.